Helle´s miniatures – A woman with an artistic view handling the everyday life "in a small perspective"
A woman with an artistic view handling the everyday life "in a small perspective"
Today I will show the steps from raw stone to sculpture. Sometimes the stone itself determines the outcome of the final product. At first I wanted to make a vase but the first shape was a bit too big. I looked at the piece and imagined a body. Why not make a torso. This stone was rather soft so it was easy to cut. The difficulty with a soft stone is that it will easily fragment when carving so you have to be very careful. A lightbox with a mirror makes a feeling of depth. The pictures are taken from an angle that gives the box a different shape. It´s in fact a rectangle. A new soapstone bench with table, 1:12 scale. 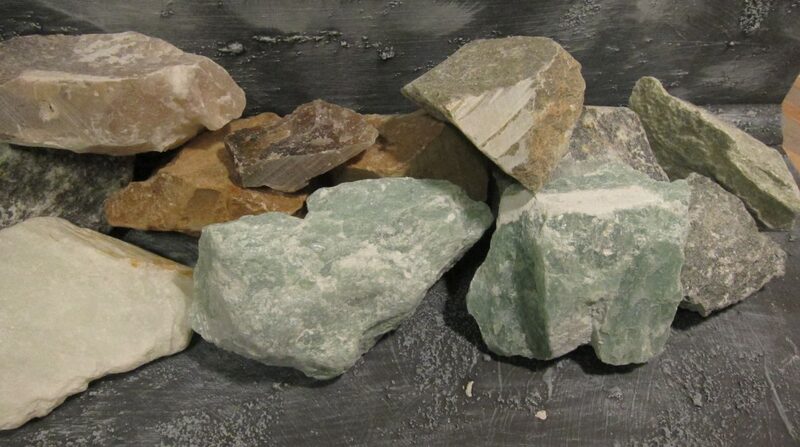 The stone has a variety of colours. When you are working with the stone you can´t see the actual colours. They appear when you polish the item with beeswax polish. It´s really amazing. As i love birds I had to make an outdoor scene with mallards and swans. The pond is in 1:24 scale. Ithink I will put light to the scene to get a feeling of evening to it. I used resin as water. I´m very happy to have recieved a space at the Kensington Christmas Show. Maybe I´ll see you there. Making faires, trolls and witches is one of my favourite activities. Combining soapstone, light and a fairy in a garden scene is an attempt to create a sense of mysticisim. Some work among many others is the painting below. The troll couple was a present for my daughters wedding. After a long break I´m back with new items. The first thing I want to show is my light pedestal, which has been developed thanks to Jennifer Smith (small scale lights). I usually use them for the translucent soap stone items, but they can be used for anything that turns out well with light. By putting the power switch on the inside and leaving only the button visible on the outside looks much better. The pedestal light comes in two colours, Bright White and soft yellow. On the pictures below I´ve put the same resin object with different lights. During the London Dollshouse Festival I got inspired by a lot of visitors when we talked about ancient soap-stone works. The philosopher below has got a brother that I call “The tired guy”. They are both inspired by ancient sculptures from Africa.